The tree is decorated and the presents are wrapped. The few cards I will send this year left my house this week, but the cookies are not baked yet. 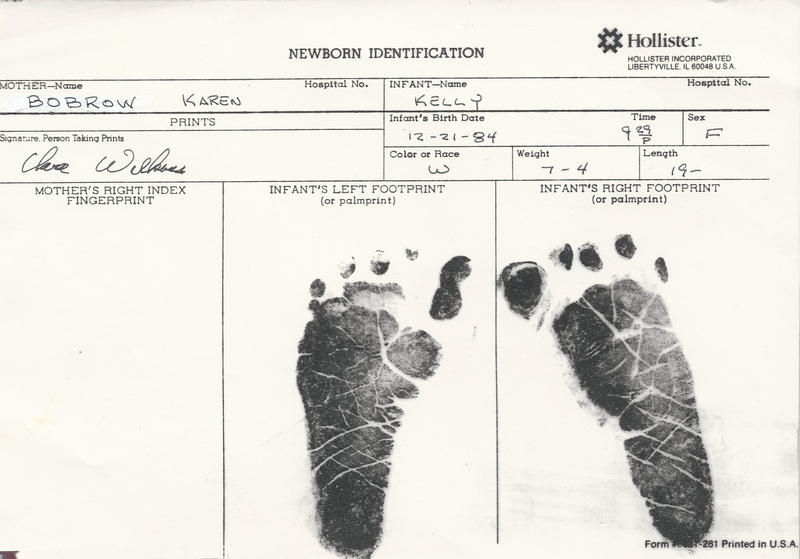 I am not as organized as I was the year Kelly was born. But on this day–the eve of her birthday–as I sit at my computer, I cannot help but think how this year’s Christmas is similar to that year. You were late in coming, Kelly, but just five days before Christmas, I was still expecting to be entertaining my family. Did I think I would still be pregnant, or did I even consider that I could be in the hospital, missing my own party? Fortunately for Grandma and Grandpa, who traveled over the Hudson River and through the woods to accompany us to dinner, the weather was clear and the temperatures above freezing. Just today, you and I discussed the meal I ordered that night: soup, salad, baked ziti with meatballs and sausage, a white wine spritzer, and cheesecake. The waitress at Lucy’s Restaurant told us the story of the woman who had gone into labor just two hours after eating there two weeks ago. We laughed, but then sent Grandma and Grandpa home. At 10 pm, my water broke and we were on our way to the hospital. The waitress knew! I am not certain exactly when they returned to sit and wait for your arrival, but like the birth of your first child, it was a very long time. The three of them (Grandma Rita joined them) did not have the toys like we all did—smart phones or IPads—so I don’t know what they did to pass the time. I was lucky I had so much to eat, but after you were born that next night (9:29 pm), Grandpa went out in the rain and banged on the door of McDonald’s to get me some food. We were all home by Christmas Eve, and the house, mailbox, and trees were decorated with balloons and crepe paper by our friends, Jan and Tony. You were up every hour during your first night home, but that did not stop the Christmas party. Everyone took turns passing you around like a hot potato, and the champagne was flowing, particularly with Dad, who was just so excited that day. So this year, we are waiting the birth of your baby. While she is not expected for two more weeks, and we prepare to celebrate your birthday one day early today, I wonder if we will get a call tonight after we leave the restaurant, telling us the time has come. Will you be reading this tomorrow in your home, or will you already be in the hospital? Will this baby be just a bit early so you can celebrate Christmas 2015 with two children, or will she be late? 2015 or 2016? I can’t wait to meet her. 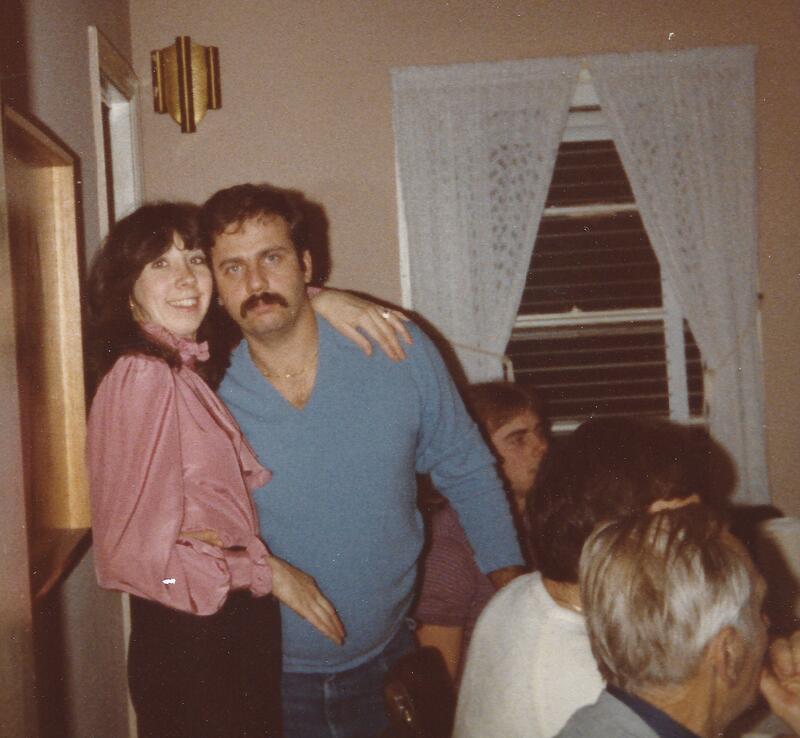 In October of 1980 we moved across and up the Hudson River to our home in New York. That was now our third Christmas as a married couple, and possibly our last year with a live Christmas tree. There was a small garden center not far from our house in Yorktown Heights, which is where I dragged Dad off to get our tree. I believe that by now he was into the holiday spirit and better skilled at maneuvering the tree into the stand. This was probably because he knew by then to not only look at the shape of the tree but also to consider the size of the trunk as well. The afternoon when we went to purchase the tree was cold—typical of Decembers in New York at that time. As we were strolling through the rows of trees and listening to Christmas carols blaring from a speaker, I remember thinking how perfect it all felt. But it was not perfect until, like in the movies, it began to snow. Christmas trees, music and snow. It was great. Since we had been in our house just over two months, we had not met many of our neighbors, so when the couple in the house next to ours invited us over for drinks, we enthusiastically accepted. We were going to Grandma and Grandpa’s house the next day and had not begun the Christmas Eve hors d’oeuvres tradition yet. We were flexible. We planned to have a nice roast pork dinner after our cocktails at the neighbors’ house, which we thought would be fine in the oven for the short time we would be visiting them. Little did we know that our new friends were very heavy-handed when pouring the drinks. We were both drinking screw drivers, and apparently when they would freshen up our glasses, they only added the vodka, not the juice. That was the most drunk I ever got, complete with the bed spins. Our arrival home was greeted by the aroma of pork cooking in the oven, which is not a welcoming smell when you are three sheets to the wind. I am not certain if we even ate much that night since we both felt so awful. We learned later that those neighbors were nicknamed “the stabbers” by the other neighbors after an incident when they got into an argument, she stabbed him, and the police somehow arrested her! But that is secondary to my story. The next morning was a very cold, snowy, and windy Christmas Day. Naturally, it was a very scary drive over the Tappan Zee Bridge when you are hungover, and Dad had to hold onto the wheel quite tightly in order to maintain his lane on the snow-covered roadway. Of course you know we made it safely to Boonton and enjoyed the holiday there and dessert with the cousins. Aunt Ar and Uncle Paul had gotten married that year, so we spent the night at their apartment. That cold night was when Dad ran out of gas (my opinion) or was it that the gas tank froze (Dad’s opinion). I have done some research and read that it is possible for gas to freeze if the temperature is low enough (it was -8 degrees) and the tank is at ¼ tank or less. So if Dad is correct, then can we now pinpoint 1980 as the year he instituted the policy of never letting the tank in the car get too low? Growing up, Dad never celebrated Christmas. I think the closest his family had to anything Christmas-like was a small decorated tree in his father’s television repair shop in the Bronx which his dad called a Hanukkah bush. They usually got in the family truckster and drove to Miami to visit his grandparents during their Christmas vacation. So marrying into a family that embraced the holiday was a fun proposition for him. I always began preparing for the holidays weeks in advance by baking cookies, which I then froze so they would not be stale by Christmas. I baked dozens upon dozens, usually at home, but a few times I went to my friend Mitzie’s house. Mitzie, her mom, our friend Lisa, and I would spend an afternoon mixing, baking, sampling, and laughing, and then bring home an assortment to share with our families. Among our favorites were spritz, peanut butter kisses, strawberry jam thumbprints, M&M’s, chocolate chips, and one I named “Ma Charlton’s Apricot filled” after Mitzie’s mother. Dad spent his first Christmas Eve at our house, sleeping in the basement. In those days, we went to midnight mass together, which was actually held at midnight. In later years, midnight mass got moved back a few hours to around 10:00, but I seem to recall that it was still referred to as “midnight mass” for a few years. Go figure! Christmas morning Dad was more anxious than my younger siblings to open his gifts, and the youngest was still a kid that year. (Uncle Dave was only twelve) I made sure he got lots of fun presents for his first Christmas. His pile of presents consisted of games like Monopoly, Clue, and Stratego. The next day, we went out and hit up the after Christmas sales for decorations for next year, when we would have our own place. 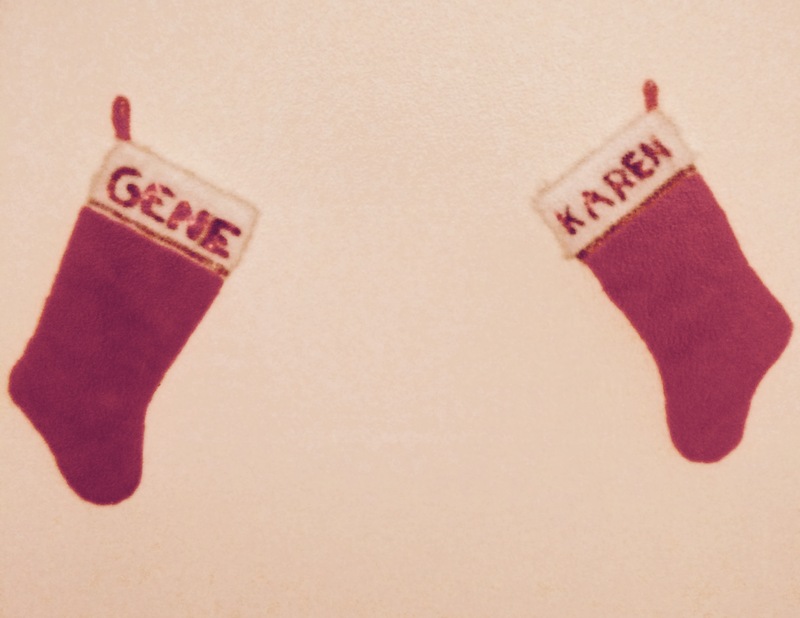 So Christmas of 1978 we were married and settled in our first home. 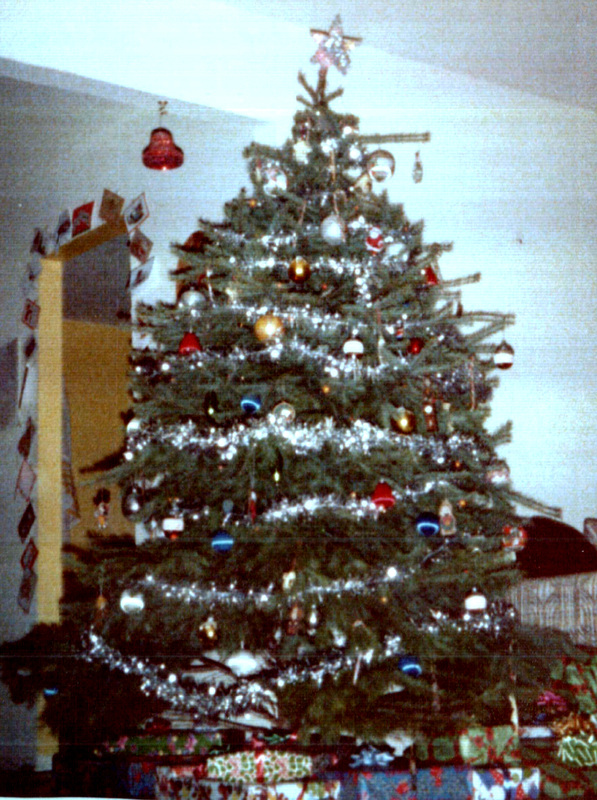 For our first few Christmases, I insisted on getting a real tree. I remember Dad had difficulty getting the tree in the stand, since this was never a skill he learned from his own father. It was a particularly cold day that first Christmas when we purchased our first tree, and Dad’s frustration level was beginning to hit a breaking point. He finally turned to me and said, “What is a nice Jewish boy from New York doing in a parking lot in New Jersey trying to put a Christmas tree in a stand?” He had a point, but it had to be done. The rest of the holiday went off without a hitch. Those were the days of vinyl albums, and, well, you all know how I love Barry Manilow. 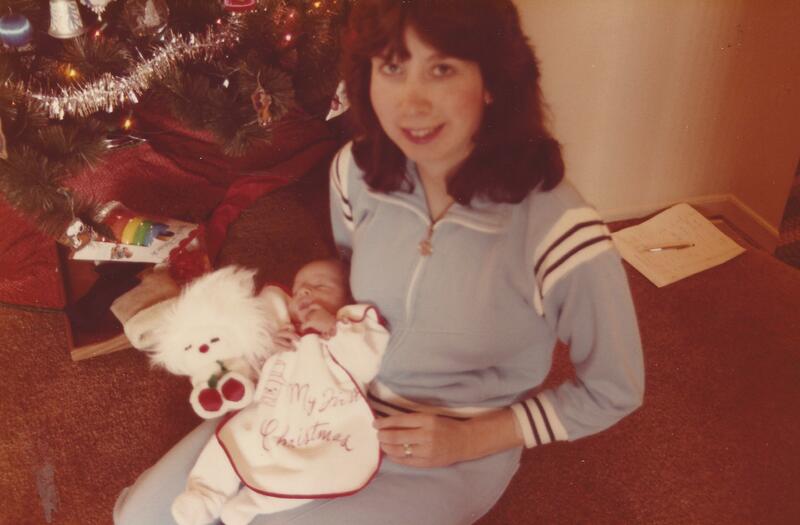 I am confident there was at least one Manilow album under our tree that year. Dad prided himself with his gift wrapping abilities, particularly his skill in not wasting a single scrap. He would wrap all his presents and leave the albums until the end. Then he would create a “wrapping paper quilt” consisting of all the pieces that I would have thrown away. He was so clever! The next day we went to Grandma and Grandpa’s house, and then to my cousin Nancy’s for cookies and dessert. The Christmas secession had not yet occurred.